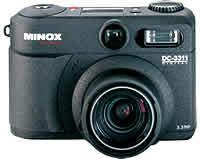 The new MINOX DC 3311 with 3x optical zoom. The popularity of digital products, particularly digital cameras, is booming. With the DC 3311, MINOX now presents its third digital compact camera which will be available at authorized dealers as from mid August. This versatile digital tool has a resolution of 3.3 pixels, providing excellent imaging results. The 3x optical zoom and the 2x digital zoom give the user plenty of scope for creative composition. The shots can either be stored in the internal memory or using an optional compact-flash card. The voice-memo function additionally permits the recording of important information or accompanying text. Clear and simple menu operation together with a bright LCD display make this camera a pleasure to use. For uncomplicated transfer of the image files to the computer the MINOX DC 3311 has a digital USB interface. Using the software MGI Photo Suite III, which comes with the camera, the pictures can be directly processed on the PC and passed on to friends and relatives. Outstanding technical data and the logical design concept of this new MINOX presentation will attract the discerning and creative digital photographer. The MINOX DC 3311 is designed with a special soft-touch lacquer and is a perfect match for today's modern high-performance lifestyle products. Compact dimensions and easy handling make this lightweight (of just 240 g) the ideal companion for every occasion. The scope of delivery includes a case, CD-ROM, 4 round cell batteries, wrist strap, USB cable and a handbook. . Compact Flash Cards (Type I). time between shots <6 sec.